962s won the French classic in '86, '87 and 1994 and many of the Motor sport worlds other endurance races and series of that time. Over its racing life the type was refined and developed by the factory and private racing teams with different engines, panels, wings and turbos etc. Of the over 148 cars produced, over 50 were built in workshops other than Porsche's. A number of private companies also produced road versions in the early 1990s. 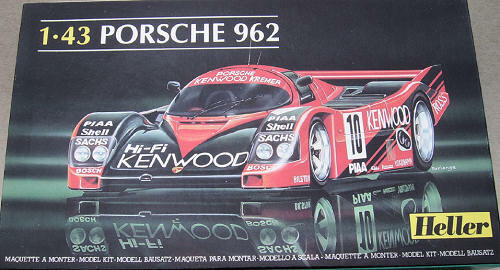 Heller's kit of the 962 was originally released in early 1988. 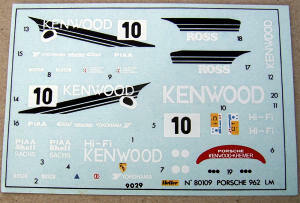 Two boxing were marketed, kit 80187 included decals for the blue Kenwood sponsored #11 and kit 80188 with decals for the Danone sponsored #33 car. In the 1990s Heller modified the molds to replace the injection molded tyres and stub axles with vinyl tyres and metal axles, this brought it into line with the other Le Mans cars it had released in the same scale after the original 962 kit. 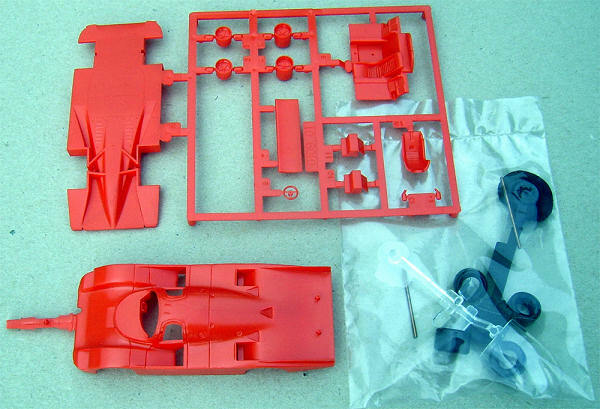 Parts are loose in the tray style box, with the instruction sheet sandwiched between the main sprue and the body. This boxing has the clear parts in a plastic bag with the new tyres and axles. The total parts count is now 23, 14 in red with 3 clear, 4 vinyl and 2 metal. Parts breakdown sees a cockpit tub complete with front faces of the side mounted radiators and the 2 racing seats (the drivers seat is a separate part) attached to a single piece chassis. The axles are inserted through this and new style wheels and tyres added. The underside of the chassis has some molded detail but there is no front suspension and the rear units are integral with the chassis and look very crude. With such a low parts count construction will be quite simple with only 2 stages on the A4 sized instruction sheet. This also includes painting details for individual parts, Heller paint numbers are used with a conversion chart to Humbrol paints on a second sheet. In this later release the reverse side of the instructions sheet shows a 5 view painting and decaling guide with the drawings in 1/43 scale. The decals look well printed with close examination showing up some colour misalignment on the driver’s nationality flags. The chosen subject is the red and black #10 car out of the Porsche Kremer Racing workshop driven by Kunimitsu Takahashi, Giovanni Lavaggi and Bruno Giacomelli from the 1989 Le Mans 24 hours. This car started 14th but did not finish due to a fire on its 304th lap. A video of this can be seen on U tube. Perhaps an idea there for an after the fire diorama? An image of this car was found on the web and some differences are noticeable between it and the supplied parts and decals. The biggest is the wheels, it seems that #10 ran in 1989 with the wheel types supplied in the original Heller kits. The majority of Heller decal placement guide is correct, however it seems the drivers names should be located under the rear edge of the windshield. This is one kit I would like to see Heller reissue again. www.racingsportscars.com/photo.html - Images from many Sports Car races including the 1989 Le Mans.